Stir in tomatoes, olives, parsley, chicken broth, garlic and minced onions in a large skillet. Simmer for 5 minutes. Place fillets in sauce. Simmer for about 10-15 more minutes, or until fish turns white. 1. Heat oven to 450°F. Spray cookie sheet with cooking spray. 2. In 1-gallon resealable food-storage plastic bag, stir together Bisquick® mix, cheese, salt and paprika. Dip chicken strips into egg product; place in bag of Bisquick mixture. Seal bag; shake to coat. Place chicken on cookie sheet. Spray with cooking spray. 3. Bake 12 to 14 minutes. Dip in sauces if desired. This is 1/3 of the original recipe. I think it's originally meant for parties/holidays. 1. Heat all ingredients in a saucepan until cream cheese is melted and mixture is heated through. Bring a large skillet sprayed with nonstick spray to medium-high heat on the stove. Brown the beef, drain, and place in the crockpot. In a bowl, combine cornmeal with broth and whisk thoroughly. Let stand for 5 minutes. Add cornmeal mixture to the crock pot along with all other ingredients. Mix thoroughly. Cover and cook on high for 3 - 4 hours or on low for 7 - 8 hours. Whisk barbecue sauce, water, ketchup, sweetener, salt and pepper in a medium bowl. Heat skillet sprayed with cooking spray over medium heat. Add sausage and cook, stirring, until beginning to brown. Add minced onion and spinach and cook, stirring occasionally, until warm. Reduce heat to medium-low; add beans and the sauce mixture to the pan. Gently stir to combine, cover and cook until heated through, about 3-5 minutes. Heat oven to 350°F. Spray 8x12in pan with cooking spray. (Sprinkle pecans evenly in bottom of pan-if using). Cut each roll in quarters. Arrange rolls pieces evenly in pan (over pecans, if using). In small microwavable bowl, microwave ice cream, caramel topping, imitation butter and contents of the icing packet uncovered on High 1 to 2 minutes, stirring once, until melted. Stir until smooth; pour over rolls. Bake 22 to 25 minutes or until biscuits are golden brown and no longer doughy. (I didn't do this, I left it in the pan: Meanwhile, line cookie sheet with foil. Place foil-lined sheet upside down on loaf pan of rolls; carefully turn over. Leave loaf pan over rolls 1 minute.) Serve warm. Boil chicken for 10 minutes, cool, and shred into small pieces. Follow the preparation instructions on the potato box (stopping before placing in the oven). Add the vegetables and the shredded chicken. Place dish in the oven for 20 minutes. Remove and let cool for 5 minutes to thicken sauce. Top with 1/4 cup parmesan before cutting and serving. Boil the chicken for 10 minutes until cooked through. Cool and flake with a fork. Heat a griddle to 350 (or you can use a skillet). Add remaining ingredients (minus the tortillas and the garnishes) to the bowl and stir. Place 3 tortillas on the hot griddle. Scoop 1/3 of the chicken mixture on each tortilla and cover with remaining 3 tortillas. Cook a few minutes on each side until heated through and cheese is melted. Cut into wedges or halves and garnish with salsa, sour cream and/or guacamole. MIX cream cheese, spinach, mozzarella and 1 1/2 Tbsp. 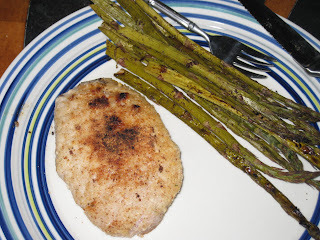 Parmesan until well blended; spread onto chicken breasts. Starting at one short end of each breast, roll up chicken tightly. Secure with wooden toothpicks. Place egg beater in a shallow dish. Mix remaining 1 tbsp Parmesan and bread crumbs in separate shallow dish. Dip chicken in egg, then roll in crumb mixture. Place, seam-sides down, in 13x9-inch baking dish sprayed with cooking spray. BAKE 20 min. or until chicken is done (165ºF). Remove and discard toothpicks, if using. Serve topped with tomato sauce and additional parmesan if desired. Add all ingredients to a crockpot and heat on low for as long as needed. Add water as necessary to reach desired consistency. You can add the beef to the crockpot raw, but it does change the texture a bit. Also makes a good Frito pie or chili dog. *Edit: If you use 1 can of tomato SAUCE (instead of paste), you don't have to add water, and it brings the total calories to only 235. :) I liked it better. Note: This recipe takes near 2 hours start to finish! I've modified the original recipe to make it healthier. 3/4 cup couscous (optional) plus 3/4 cup water. In small glass bowl, place chicken and add flour. Toss chicken to coat. Spray skillet w/ cooking spray. Place chicken in pan; brown on all sides. Reduce heat to medium-low; add minced onion, garlic and ginger. Saute about 5 minutes. Stir in coriander and cumin; saute until aromatic, about 30 seconds. Add 1 cup chicken broth. Increase heat to high. Boil until liquid has reduced by half. Stir in remaining 2 cups chicken broth, apricots, almonds and olives. Bring to a simmer; reduce heat to low, cover pot and simmer for 45 minutes. Prepare couscous by measuring 3/4 cup and placing it in a bowl. Add 3/4 boiling water (microwave works), and cover for 5 minutes. Fluff couscous with a fork. 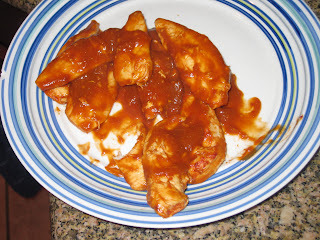 Cook chicken on a skillet or in a George Foreman grill until cooked through. Whisk mayonnaise, cayenne pepper, tobasco and the vinegar in a small bowl. Stir in blue cheese dressing. To assemble wraps: Lay a pita on a plate. Spread with 1 tablespoon blue cheese mixture and top with the chicken, & lettuce. Drizzle with more tobasco if desired and roll into a wrap sandwich. Mix all ingredients except egg beaters in a pan and bring to a boil. When broth has come to a boil slowly drop egg in, 1 spoonful at a time. 2. Soften the marmalade in a bowl in the microwave for about 10 seconds (just enough to stir it smooth. 3. Place the chicken in the bowl with the marmalade and stir to coat. 4. Place the breadcrumbs in a bowl. Roll the orange covered chicken in the crumbs and place on a sprayed baking dish. 5. Bake 15 minutes or until cooked through. 6. Meanwhile, heat all the sauce ingredients (minus the cornstarch and water) in a small saucepan. Mix the corn starch and water in a bowl. 7. When mixture is boiling, add the cornstarch mixture and stir constantly on med-high heat until thickened. Immediately remove from heat. 8. Dip the chicken in the sauce! Desired toppings: turkey pepperoni, bell peppers, mushrooms, etc. 1. Assemble ingredients on pita like a pizza and sprinkle with spices. 2. Cook at 400 for about 12 minutes, or until browned and cheese is bubbly. Cook rice or couscous according to package directions. In a large skillet sprayed with vegetable cooking spray, sauté bell pepper for 5 minutes until tender. Stir in chicken and pineapple and cook for another 5 minutes until chicken is cooked through. In a small bowl combine the 1/4 cup reserved pineapple juice, water, cornstarch, vinegar, brown sugar, garlic, and ginger. Stir well. Pour mixture into chicken mixture. Mix well to combine. Continue cooking for 5 minutes or until mixture thickens, stirring often. Fold in banana and almonds. Heat through. From Kraft's web site. Mix and match ingredients. Pick one: chili powder, cinnamon, dry mustard, nutmeg or italian seasoning. Melt all ingredients together in a fondue pot and dip apples, sausage, bread, chips, veggies or whatever you want in there! Mix garlic, chopped onions, vinegar, salt, pepper, paprika, coriander and olive oil in a big bowl. Place chicken in a ziploc bag and add garlic marinade. Marinate for >2 hours. You can marinate for a stronger taste overnight. Place all ingredients in a baking dish coated with cooking spray and bake for 1 hour until golden brown. (You can also grill). When done, place in serving dish and sprinkle parsley over wings. Place chicken in a ziploc bag. Add flour, salt and pepper. Melt imitation butter in a large skillet over medium-high heat. Add battered chicken to pan; cook 4 minutes on each side or until cooked through. Remove chicken from pan; keep warm. Add broth (water+bruillon), garlic and artichokes to pan, scraping pan to loosen browned bits; cook 2 min. Add cream cheese and stir until melted. Remove from heat, stir in lemon juice and chicken. HEAT oven to 300ºF. Reserve 1 cup dry cake mix. Mix remaining cake mix with 1 egg beater, apple sauce and 1/3 cup brown sugar with mixer. (Mixture will be crumbly.) Press onto bottom and 1 inch up sides of greased 13×9-inch baking pan. BEAT cream cheese and remaining brown sugar, and splenda with mixer. Add reserved cake mix, remaining eggbeaters and lemon juice; beat 1 min. Blend in soy milk. (Batter will be very thin.) Pour into crust. BAKE 1 hour and 20 minutes. or until center is almost set. Cool. Refrigerate 4 hours. Top with COOL WHIP. Refrigerate leftovers. Heat pan to med-high heat. Mix diet coke and ketchup in a bowl. Place chicken and diet coke mixture in the pan and bring to a boil. Reduce to simmer and cook, uncovered and turning chicken occasionally, for 20 minutes, until chicken is cooked through and sauce has thickened into a barbecue sauce. Jeremy even likes this and he hates diet coke! It doesn't taste "diety" at all...just like barbecue chicken! Parboil carrots in water in the microwave (about 4 minutes). Add broth, (water), salmon, brocoli/cauliflower and chives (or scallions) to a large pot and bring to a simmer. Add carrots. Stir potato flakes (or leftover mashed potatoes) and mustard into the soup until well blended. Return to a simmer. Season with salt and pepper. Salt, garlic powder, and black pepper to taste. (If desired) peel the asparagus with a potato peeler (it makes it softer when cooked). Place aluminum foil on a cookie sheet and spray w/ cooking spray. Place the asparagus on the foil. Sprinkle with balsamic vinegar and spices. Roll the asparagus around in the vinegar/spices until coated. Bake at 400 for about 20 minutes. 1. Trim the fat off the pork. Heat a pan on the stove to medium-high. 2. Mix the bread crumbs and the parmesan together in a shallow bowl. 3. Dredge the meat on both sides in the parmesan mixture. 4. Spray the pan with cooking spray and lay the pork chops on the pan. Spray the top of the meat with cooking spray. 5. Cook several minutes on each side until the meat is cooked through. Add fish, tomatoes and their juices, pepper, cilantro, olives, garlic powder, minced onion, oregano and salt; stir to combine. Add up to 1/2 cup water if the mixture seems dry. Cover and simmer for 20 minutes. Remove from the heat. Serve warm, garnished with avocado (if using). Add about 45 calories to the recipe if you top it with 28g avocado (1/3 small), as pictured above. A yummy PF Chang's copy cat. Make the special sauce by dissolving the sugar in water in a small bowl. Add soy sauce, rice wine vinegar, ketchup, lemon juice, mustard, tobasco and garlic powder. Mix well and refrigerate this sauce until you're ready to serve. Boil chicken for 10 minutes. Pour chicken in a strainer and cool. As chicken cools mince water chestnuts (or carrots) and mushrooms to about the size of small peas. Prepare the stir fry sauce by mixing the soy sauce, splenda, and rice vinegar together in a small bowl. When chicken is cool, shred it into small pieces. Heat a pan (or wok) to medium-high. When hot, coat with cooking spray. Add chicken, garlic, onions, water chestnuts and mushrooms to the pan. Spoon the mixture in the lettuce"cups" (leaves) and roll up like burritos. Place tilapia in a baking dish coated in cooking spray. Sprinkle with Salt & Pepper and bake at 350 for 20 minutes or until fish flakes with a fork. Meanwhile, Combine pineapple, pineapple juice, lime juice and garlic in medium saucepan. Heat to boiling. Reduce heat. Simmer, uncovered, 2 to 3 minutes. Combine cold water and cornstarch; stir into boiling mixture. Boil, stirring constantly until thickened. Remove from heat. Stir in cilantro and jalapeno pepper. Stir in splenda, season to taste with salt and pepper. To serve, spoon warm sauce over fish.